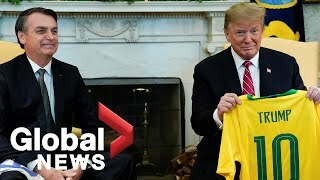 Trump, Bolsonaro exchange national soccer team jerseys U.S. President Donald Trump and Brazilian President Jair Bolsonaro exchanged their country's team soccer jerseys with each other's names printed on the back. Oh, the profound timeless symbolism of exchanging soccer jerseys and of the President of Brazil visiting CIA Headquarters! BBC: "This time, it is different. There's truly going to be a north-south axis of the two largest economies in the Western Hemisphere." They are certainly words that will please Jair Bolsonaro, the man dubbed "Trump of the Tropics", who, it seems, has finally met his idol. "I've always admired the USA and this sense of admiration has only increased since you took office," Mr Bolsonaro said to Mr Trump as they gave a joint press conference in the Rose Garden. At times, during this trip, he's sounded like a Trump super-fan rather than the leader of one of the world's biggest economies. Brazil's new fascist president, Jair Bolsonaro visited CIA headquarters and to visit President Donald Trump and reports are that the meeting went very well not surprisingly, given how similar their politics and personalities are. Bolsonaro shares Trump's penchant for racist, xenophobic remarks, calling immigrants from poor countries "the scum of the earth," and also has a history of strongly sexist statements. "Brazil and the United States are tied by the guarantee of liberty, respect for the traditional family, the fear of God our creator, against gender identity, political correctness and fake news," announced the new Brazilian president, who promises to fight against "cultural Marxism." the far-right conspiracy theory. Trump was equally pleased with the meeting. "The relationship we have right now with Brazil has never been better," Trump said, and that he was in favor of Brazil joining NATO. 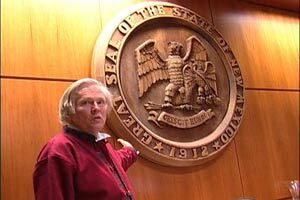 "We're looking at it very strongly," he said, "We're very inclined to do that." The expansion of NATO deeper into South America rings alarm bells for all independent and non-aligned nations in the region and signals a huge change in Brazilian foreign policy. Brazil under the social-democratic Workers' Party had been independent and non-interventionist, refusing to countenance American coups in the region, much to the chagrin of Washington. Former President and currently jailed political prisoner Lula da Silva called himself an anti-imperialist and an internationalist but the visit of the current head of state to CIA headquarters Langley confirms many of Bolsonaro's opponents' predictions that he would be happy to serve as United States's lapdog. Bolsonaro's first months in office have been highly controversial, including enacting policies militarizing society, gutting already weak environmental regulations and dispossessing indigenous peoples from their land. Bolsonaro appointed University of Chicago-trained Paulo Guedes as his economics minister. Guedes was closely associated with fascist General Augusto Pinochet's regime in Chile and proposes a "Pinochet style" solution for Brazil, featuring an austerity package that includes the privatization of the country's pension system. Amidst an ongoing corruption scandal, Bolsonaro's approval rating has already dropped to 39 percent, and other similarities that he shares with Trump. The U.S. media was very happy at Bolsonaro's victory, with the Wall Street Journal editorial board endorsing him as a "credible" reformer and a much-needed "antidote" to the greed and corruption of the Workers' Party. Bloomberg spelled out the reasons for this, explaining that his victory completed a U.S. clean sweep of South America, noting that the only holdout against U.S. power was now Venezuela's Nicola's Maduro, who may not cling to power much longer. For Bloomberg, the election marked the end of the independence of Latin America and a return to the days when it was under total U.S. control. The media also backed the U.S.-sponsored coup against liberal President Joao Goulart in 1964 that brought about two decades of fascist military dictatorship. On Goulart, the New York Times' editorial board wrote, "We do not lament the passing of a leader who had proved so incompetent and so irresponsible," and claimed there was a "widespread feeling of deep relief and of optimism" among all of Brazil that he had been overthrown. The U.S. overthrew a number of Latin American governments during the late 20th century including Guatemala in 1953, Chile in 1973 and Grenada in 1983 while propping up highly authoritarian right-wing dictatorships. Bolsonaro was an officer during the Brazilian military dictatorship, the only mistake of which, he claims, was that it did not kill enough of its political opponents. Venezuela was a key issue in Bolsonaro's visit, with the United States openly trying to complete its "clean sweep" of Latin America. Although completely hostile to Maduro, the Brazilian government has previously refused to countenance being part of a military effort to overthrow the Maduro government. However, if Brazil is granted NATO ally status, all of Venezuela's borders would be with NATO regimes. Brazil and its health landscape are a total mess, laden and awash with pesticides particularly Roundup/Glyphosate, applied after sections of the Amazon jungle are burned down, so that the jungle won't grow back and so that Brazil can continue to be the #1 Soybean grower in the world. Brazil is the #1 user of pesticides in the world! That might not seem directly relevant to Bolsonaro's visit but it truly is since Brazil's epidemiological situation with lymphomas and other cancers will get worse and worse. Already in one NE Brazilian agricultural state, 83% of the women in the maternity wards have Roundup/Glyphosate in their breast milk. What kind of a future does that spell out for Brazilians? This was a hard article to "like" since the topic makes me sick. I can't stand Trump, I hate our illegal, aggressive wars, I hate that corporations are now "people". I hate the coups that the US have backed. I hate our rigged elections. I hate the Electoral College system which, of late, have given us both GW and Trump and their horrible policies. I say we demand our government to get back to basics...for, of and by the people. 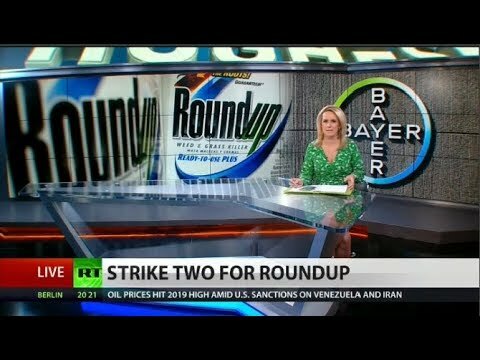 And Monsanto's glyphosate must be banned..it does cause cancer and has actually ruined the businesses of some farmers around the world. You can like the treatment of the horrible subjects; this story had to be written, no matter how ghastly the subjects are, and as you know I try to write things that no one else is writing about, and sometimes writing about what others have written, if I really like or if I really DON'T like the journalism, my own GONZO style, perhaps inspired by Hunter S. Thompson? This is Trump's latest speech warning Maduro. Do watch it, and try not to use your barf bag. 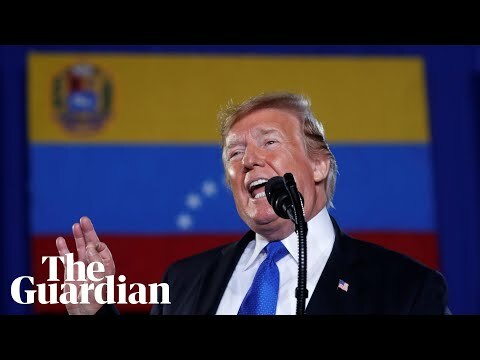 Donald Trump's direct appeal to Venezuelan military to back Juan Guaid Donald Trump has used a speech in Miami, Florida, to issue a direct appeal to members of the Venezuelan military to back opposition leader Juan Guaid.